Burrtec Waste Industries (Burrtec) offers a comprehensive commingled recycling program which is free to its businesses in Santa Clarita. Commingled recycling simply means that you can place all of the items listed in the flyer below into the recycling bin without separating each type of material into its own bag or compartment and Burrtec will take care of the rest. Certain California legislation requires businesses to establish specific types of recycling programs. See below for more information and if your business is not recycling, please contact Burrtec at (661) 222-2249 to establish a program and keep these items out of the landfill. Assembly Bill 341 became effective on October 6, 2011, which mandates businesses and multifamily complexes to establish regular recycling collection. This means all Santa Clarita businesses with four yards or more of collection services per week are required to establish and maintain recycling service. 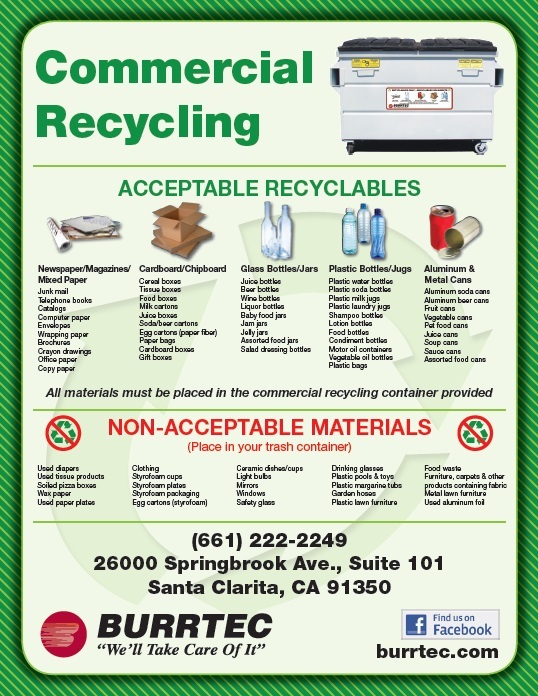 Fortunately, the franchise between the City of Santa Clarita and Burrtec offers free recycling containers to all businesses within City limits. The recycling containers are available in either 1.5-cubic-yard or 3-cubic-yard containers. We encourage businesses to take advantage of this free service to start recycling and save money to comply with the state mandate. Please contact Burrtec’s Customer Service Department at (661) 222-2249 to assist your business in setting up free recycling. Read more about the State regulation. 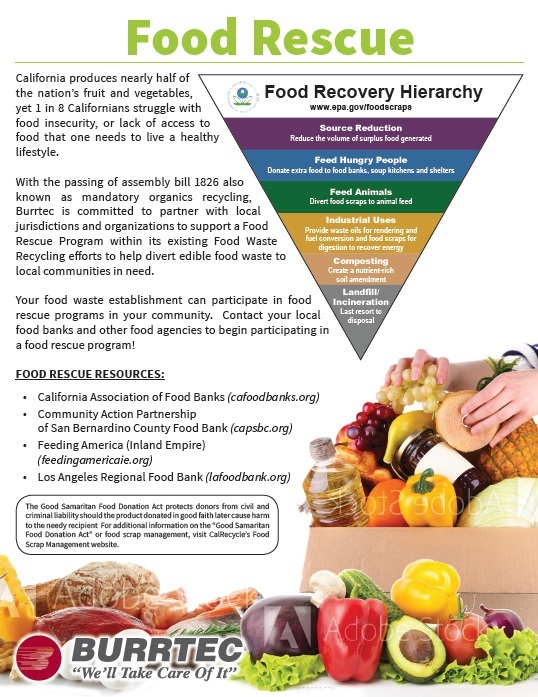 Assembly Bill 1826 became effective April 1, 2016 which requires businesses to establish an organics (food waste) recycling or donation program. The law phases in the requirements on businesses and multifamily residential dwellings over time based on the following dates by 2019. Additionally, the State law contains a trigger that will increase the scope of affected businesses, if waste reduction targets are not met. 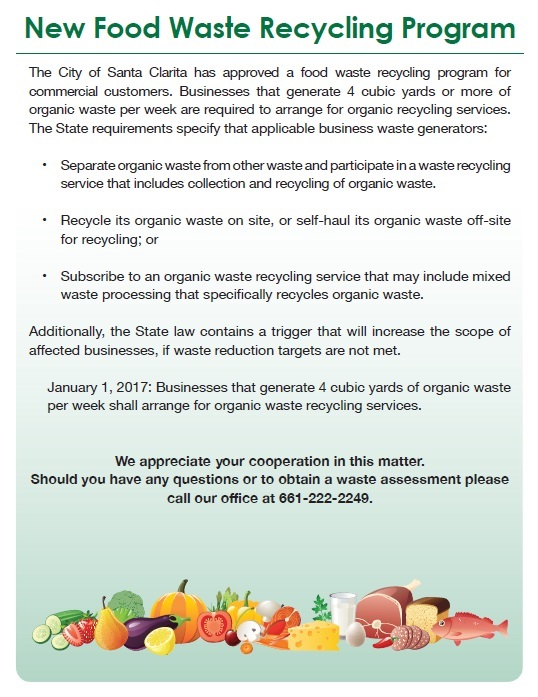 January 1, 2020: On or after January 1, 2020, the organic recycling requirements on businesses will expand to cover businesses that generate 2 cubic yards or more of commercial solid waste per week. Fortunately, in order to comply with this mandate, there are several ways a business can participate. 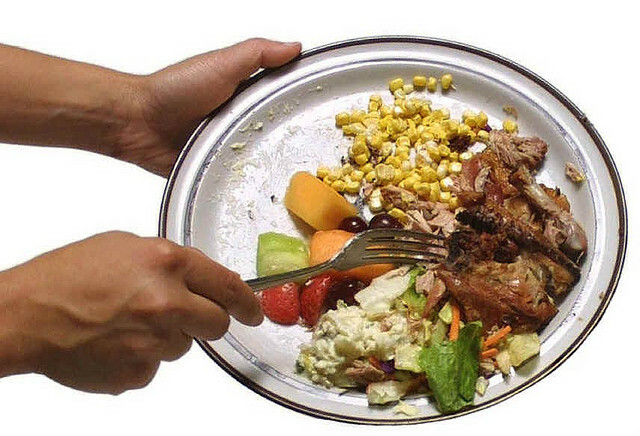 Establish a food waste recycling program. See this flyer for details then contact Burrtec for more information or to establish a program. 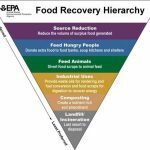 Participate in a food recovery or food donation program. 1 in 8 Californians struggle with lack of access to food so this is a great way to reduce waste going to the landfill and help our neighbors at the same time. See this flyer for details. Recycle food waste on-site or self-haul to an off-site location for recycling. In order for us to gain an understanding of your food waste disposal needs, please complete this questionnaire and email it to cwilliams@santa-clarita.com. Whatever program you decide to incorporate at your business, Burrtec and the City of Santa Clarita will provide support and assistance so that you can be successful in complying with State law and reducing waste that goes to the landfill.